BAKING THIS SWEET BREAD with Fruit and nuts for Christmas morning breakfast has been a holiday tradition in our family for several years. I make several batches weeks ahead and freeze – pulling from the freezer on Christmas Eve to thaw, and re-heating for a few minutes in the oven. NaBloPoMo Day 11. I BAKE THE LOAVES IN MINI LOAF PANS, as that gives flexibility to pull out just the amount I need from the freezer. Christmas Morning Bread is delicious served with a dish of fresh fruit in a beautiful glass bowl, yogurt, juice and coffee. This is a satisfying and quick early morning repast until after Christmas gifts are opened. Then it’s time to prepare a BIG Christmas brunch. THE CHRISTMAS MORNING BREAD is also a delicious way to share one of our family traditions with neighbors and friends. I wrap the loaf in saran wrap with a colorful bow, and deliver it a day or two before Christmas in a small basket or tin. I attach a note wishing them Happy Holidays, mentioning that we serve this sweet bread on Christmas morning. ALSO – I HAVE USED THIS RECIPE TO MAKE CUPCAKES and frost with a cream cheese icing to create small gifts to give during the holidays. For example, a hot cupcake and a cup of cocoa to the mailman on a cold December day when he arrives with our mail in his mail truck. I have been asked for this recipe many times. So, here it is – one of our family traditions for you to experiment with and improve with your own ideas. 3/4 cup mixture of any 3 of these fruits: fresh or frozen blueberries, raspberries, drained crushed pineapple, drained and chopped mandarin oranges, blackberries. Select for a variety in color and taste. Coat fruit and nuts with small amount of dry nut bread mix, so they will not tend to float to the top in baking. Combine gently but well, using large spoon the bread mixes, beaten eggs, yogurt, water, orange juice and spice. Fold in fruit, nuts and zest. Don’t beat. Bake at 350 degrees for 35-45 minutes in loaf pans. Reduce time if made as mini loaf pans or cupcakes. Test for done with tester. While breads are baking, simmer orange peel strips in saucepan with 1 round Tablespoon sugar till orange est is transparent and tender. Cool on wax paper. Mix powdered sugar, orange juice and butter. 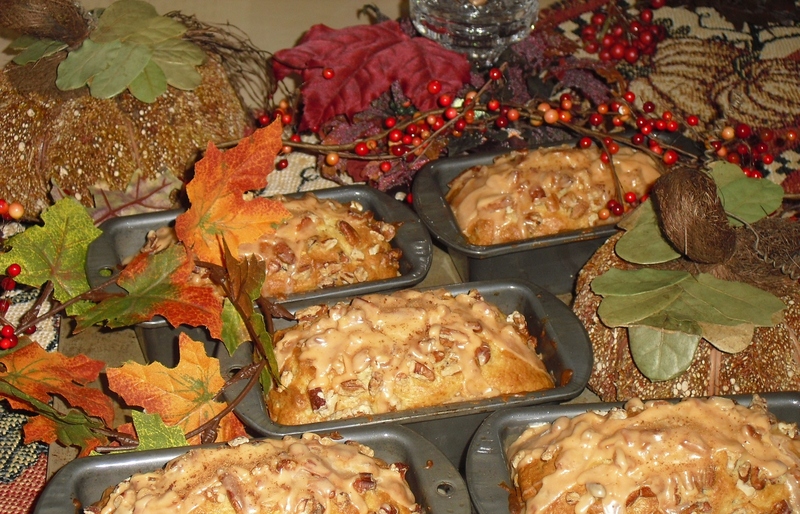 When fruit breads are partially cool, drizzle icing on loaves, sprinkle with chopped pecans. When serving, arrange candied orange peel on top to decorate. WHAT IS YOUR FOOD TRADITION on Christmas morning? Previous PostSix Ways to Reduce Stress During the HolidaysNext PostRemember Veterans Day All Year! Sounds positively yummy. Tom and I are both diabetics and this would take a great deal of work to cope with exchanges, etc. These look delicious. I have printed off the recipe and I will try it later this week. Thanks for sharing.